Here are seven apps that are much more fun than the news. You need to spend time with these apps (some are actually useful) because these days too much news will drive you bananas. For example, before noon today, Paul Ryan announced his retirement; John Boehner announced that he’s joining one of the biggest pot companies; the president’s bellicose Tweets threatened to start World War 3. And then, Mark Zuckerberg testified for four or five hours before Congress, where some Congresspersons were no better versed in Facebook than they were in the thousand-page bills that they admit to signing without reading. 1- Horror Channel Night Terror Alarm Clock Have trouble waking up in the morning? 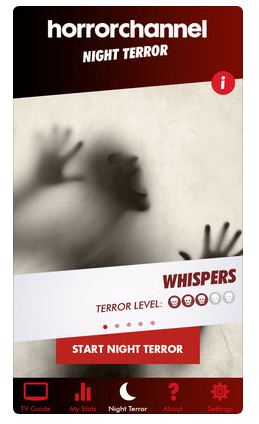 Use the horror alarm to wake up with a scream… you’ll be glad to get out of bed. This will definitely get you up without hitting the snooze alarm. It does have a panic button, in case you chicken out. 2- If that’s too scary, there’s Wakie – a fun, friendly community of people who wake each other up in the morning. 3- Shhhh is a mobile application that turns off all notifications and alarms automatically to stay tuned with friends and family when spending time together. And to give you quiet time to get work done. 4- Procreate is a multi-award winning painting app for iPad designed for creative professionals. Made exclusively for iPad, Procreate allows you to create sketches, paintings, and illustrations. It costs $9.99. 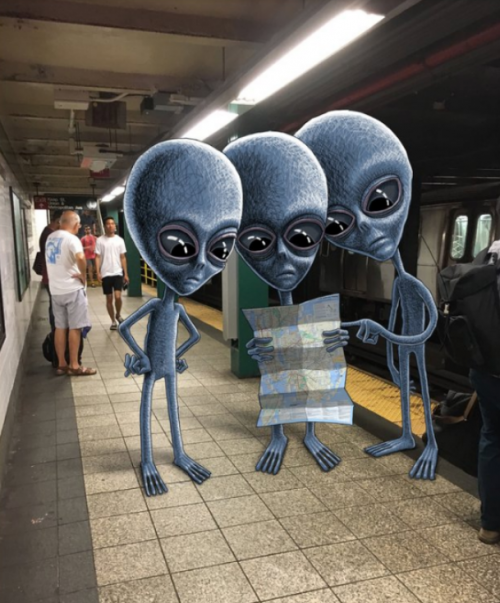 An artist who goes by the name Subway Doodle uses Procreate to add monsters to photos he takes on iPhone and transfers to iPad. He sells prints on instagram for $25 and up on his website. He says Subway Doodle resides in Brooklyn, NY with a house full of monsters. Every purchase goes directly to feeding their insatiable appetite for bacon. This one is called Subway Tourists. 6- Noisli – A choice of background sounds helps you improve focus and enhance creativity. A new study suggests that the ambient background noise or buzz of conversation in public places can fuel creativity, for example. But if coffee shop buzz doesn’t do it for you, how about the ocean and birds, rain, train whistles….